CORINTO, Honduras , Sep 3 2014 (IPS) - The clock marks 9 AM when a bus coming from the Mexican city of Tapachula reaches Corinto, on the border between Honduras and Guatemala. It is the first bus of the day, carrying children and their families sent back from a failed attempt at making it across the border into the United States. The bus is carrying 19 children between the ages of five and 12, six women and seven men, all of them families. The trip took 10 hours. A team of volunteers from Red Cross Honduras, supported by the International Committee of the Red Cross (ICRC), meets them and climbs aboard to provide them with bags of essentials. It is the first stop the bus will make in Honduras, in the northwestern department or province of Cortés. Its destination is the nearby city of San Pedro Sula, where they will be censused in a government shelter and given a bag of food and a small amount of money to help them return to their homes. The authorities don’t allow journalists to interview, photograph or film the minors. But this IPS reporter is allowed to get on the bus, where I see the sad, exhausted faces of the children. Their parents or other relatives look down into their laps, to hide their pain, defeat and sense of impotence. Today, four busloads of deported immigrants – two of which carry children as well as adults – totaling 152 people come through customs at Corinto. The flow is steady, although minors only arrive, alone or accompanied, on Mondays, Wednesdays and Fridays. 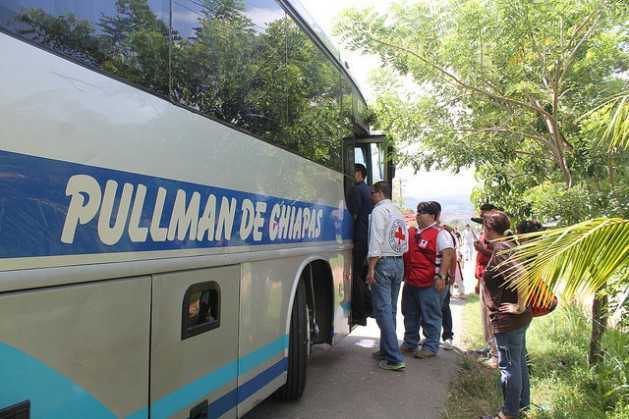 “The buses bring an average of 30 to 38 people,” Yahely Milla, a volunteer with the Red Cross team, explains to IPS. She says “the mass deportation of minors started in April,” and in May and June, when the crisis of unaccompanied Central American child immigrants broke out in the United States, up to 15 buses a day were arriving. “Children from the age of three months to 10 years, some of them alone and others accompanied by their parents, came one time; it had a big impact on us because we hadn’t seen so many deportations since we have been here at the border,” she said. Corinto is 362 km from the capital, Tegucigalpa. It is one of the main areas along the border used by Hondurans heading north on the migration route to the United States. There are at least 80 “blind spots” used by migrants to cross the border into Guatemala before continuing on to Mexico and, if they’re lucky, to the United States. The authorities have beefed up controls along the border, which has slightly curbed the exodus. Institutions are practically nonexistent here and the only support for deported migrants comes from the Red Cross and the ICRC, which has been operating in this town for about two years. The only time the government made an appearance, people here say, was in July, when the deportations spiked and Ana Hernández, the wife of president Juan Orlando Hernández, came to receive a group of children. Over a month later, the promised camps have not yet been built, and there isn’t even a toilet at the bus stop for the deportees to use. Between buses, Mauricio Paredes, the head of the Red Cross at the Corinto post, explained to IPS how the reception centre works. The magnitude of the humanitarian crisis has made it necessary to ration the aid. For children there are disposable diapers, water, baby bottles and IV saline solution, while the adults are given water, toilet paper, toothpaste and toothbrushes, sanitary pads for women and razors for men. They are also allowed a three-minute call to phone their families. The sun is beating down five hours later when the next bus comes, from the Mexican town of Acayuca. It brings 38 immigrants, including adolescents and adults. One of them, 19-year-old Daniela Díaz, calls her mother to tell her that she is back from her second attempt to reach the United States. She then tells IPS about her odyssey. “I set out on this journey nine months ago and although it’s my second try, I was still shocked by what I saw,” she says. “This time I managed to get up on The Beast [the Mexican cargo train used by migrants, who ride on top of the wagons], but horrible things happen there. I saw women raped, I saw how the coyotes [migrant smugglers] sell people to criminal bands,” she says, speaking with long pauses. “It’s awful to see people killed or just left lying there, people from your country. Things are really ugly there, I’m relieved to be back because I’m alive, others aren’t, they were killed by the criminals and some were thrown off the train. I saw all that and it feels really bad,” she says with a broken voice. “What you go through is so tough that I almost have no tears left. I went out of need, because there’s no work here, my family is very poor, sometimes we eat, sometimes we don’t, we are five brothers and sisters, I’m the youngest and the most rebellious, my mom says,” adds the young woman who is from Miramesí, a poor neighbourhood in the capital. But despite her experiences, she says she’s going to try it again. “Going to the United States is my dream, and I’ll do it even if I die in the attempt,” she says, while getting ready to hitchhike – or walk – back to the capital, because she came back without a cent. The deportees return like Díaz – without money and with a broken dream. Poverty and violent crime are the main factors driving Hondurans to attempt the dangerous trek to the United States, experts say. Between October 2013 and May 2014, an estimated 13,000 unaccompanied Honduran minors reached the United States. 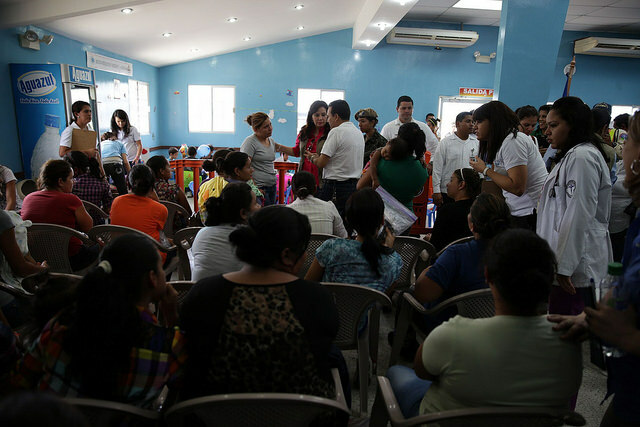 In the first six months of this year, some 30,000 Hondurans were deported by the United States and Mexico, according to the governmental Centro de Atención al Migrante Retornado (Reception Centre for Returned Migrants). David López, 18, comes from Copán Ruinas in the western department of Copán, one of the “hot spots” in the country, where organised crime flourishes. That is what he was fleeing. But he came back frightened, defeated and frustrated. He was assaulted twice by criminal bands that operate along the migration route. “I left because it’s not safe to live here anymore, you see things that it’s better not to talk about. I told myself, it’s time to leave the countryside, and I came back defeated, yes alive!…but defeated,” he tells IPS with a pained voice. His aquiline features crumple as he remembers the assaults, the abuse, the drought and the hunger he survived. In August alone some 19,000 deportees were brought back to the country through Corinto – as many as arrived in all of 2013, Paredes said. This Central American nation of 8.4 million, where 65 percent of households are poor, is also one of the most violent countries in the world, with a homicide rate of 79.7 per 100,000 population, according to the Honduran Observatory on Violence.